I felt it was about time this had a makeover. Needless to say, I now wish I'd saved a screen-grab of the old layout and design to compare with the changes I've made. *sighs* Oh well, should have planned better! 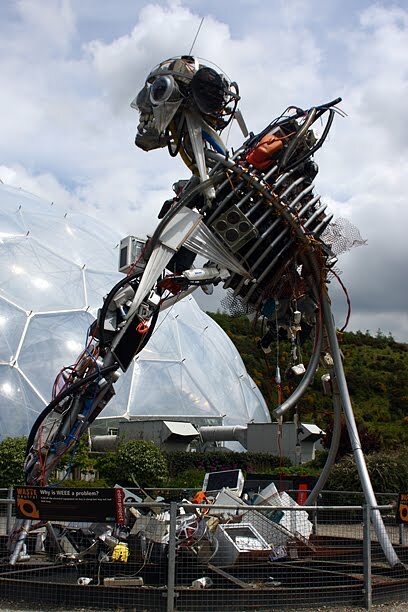 Meet "WEEE Man" - he lives at the Eden Project and is constructed almost entirely from things which would otherwise be in landfill sites. Look carefully - view the larger version of the shot if you need to, and see how many different electrical items or parts thereof you can see. It took us a while to realise that the teeth are computer mice - clever eh?! One thing which is becoming abundantly clear to most of the population now is that we simply have to stop throwing stuff in the direction of landfill.This is something which the residents of the Hebrides have already realised - when you have an environment like that the very last thing you want to do is fill it with rubbish so they are already incredibly good at recycling, most households have multiple bins and even those in the most remote areas have at least a recycling bin and a general waste bin, plus "kitchen caddy" for food waste. Newspapers are used as fire-building material and other paper waste is burnt. Fruit and veg trimmings go for compost. Bottle, can & plastic banks are used religiously by the islanders and very few would dream of just throwing these items away. Something as simple as taking your own bags to the supermarket can make a real difference so remember to check your "bag for life" stash is in the car...better still, why not start a collection of super-cool reusable jute, hessian or cotton bags and use those instead - cared for properly and repaired if needed these truly could be bags "for life".